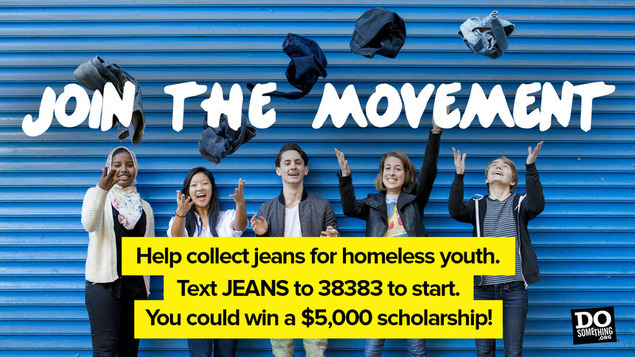 Enter the Teens for Jeans DoSomething scholarship now! Over a million young people experience homelessness in the US every year. One item they often request? A pair of jeans. This February, DoSomething.org has launched the 9th annual Teens for Jeans campaign which mobilizes young people to collect jeans for teens experiencing homelessness across the country. Collect your gently worn jean(s) and drop them off at your local shelter (check out DoSomething.org’s location finder! Need another reason to participate? Every two pairs of jeans you collect earns you a chance to win the $5,000 easy scholarship or a $3,000, $2,000 or $1,000 school grant and $500 for a celebratory party. $5,000 easy scholarship or a $3,000, $2,000 or $1,000 school grant and $500 for a celebratory party. 2. Collect and donate gently used jeans to your local shelter (check out DoSomething.org’s location finder!). The deadline to donate your jeans is February 29th. Go to DoSomething.org to apply now!